Greetings holotable heroes! We are two friendly guilds looking to recruit some new members! Between the two guilds listed here we should have a good fit for players wanting to excel in all areas of the game! The Pit is a competitive guild for end game players that are looking to succeed in TW and TB. Death by the Dozen is a relaxed requirement guild that is primarily focused on HSTR farming. The two sections below are snippets of each guild with a quick overview of rules for each and a summary of what both guilds can offer you. 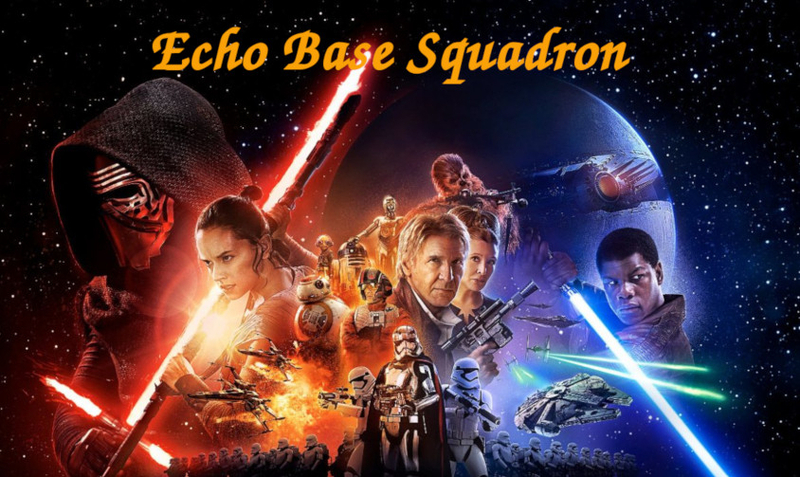 Echo Base Squadron looking for a new player. The Dread Masters are a fully heroic, organized, and social guild with 127m GP that is focused on Territory Wars and Grand Arena. Currently, we have a 42-14 record in TW, get 40* in Dark Side TB and 38* in Light. All raids have join periods then are FFA; HSTR runs at 3pm EST, HAAT at 8p, and hPit at 10. We are currently seeking recruits with deep, well developed rosters capable of immediate contribution across all guild activities. The Dread Masters try to remain as laid back as possible while remaining ambitious and organized. We have an active discord channel and a tight knit group of long time players who help each other, give advice, and stick to the few rules we have. We are fully independent, and will never be a part of an alliance, and never tell our members which characters to play or grind. We expect everyone to contribute daily, but realize that SWGOH is just a game and that Real Life takes priority. We have no strict ticket requirements, but we track stats across all guild activities to make sure every member is pulling their weight. Leave your stagnant guild for greener pastures, or take a step back from that stressful and intense guild while still earning fantastic rewards. Join us by contacting me with your swgoh.gg profile via the forums, or on discord at crewmeister#9587. IGotABadEwok just cleared our first HSith and are looking for active and Sith-Ready players to join us as we start to farm it! We have 136M GP, and get around 40* in DSTB, 38* in LSTB. We're 5-1 over the last few TWs, and have been much better on that front recently. We have a 24 hour join period on Rancor, and we launch it at 8AM/PM EST alternating. We have a 12 hour join period on HAAT, and we launch it at 9AM/PM EST alternating. Our timing for HSith is up in the air at the moment, that should be locked in soon enough. We do not have a daily ticket requirement, but we do expect participation in HSith and TW/TB and monitor those accordingly. Contact me on the forums or via discord at Mister Aardvark#5746. The Fallen Kingdom is looking for more players to add to it's ranks! We're a work and family friendly guild with active players. We get that life happens and can often pull you away from the game, so we keep things between competitive and casual. We have requirements but can make them easy to follow and we require the discord app for raids and territory battles and for wars. We require participation in territory battles and wars and have a daily ticket requirement of 500. We can help and tell you who to farm or how to manage your characters by giving you tips and help you grow. If you're looking for a guild that will support you and get traya shards come and join us! Rancor & AAT: Heroic 2x/week. Current Guild GP is 118 Million and have 3 spots left. Yorkshire Nerfherders is looking for 1 active player, 2+ mil GP. 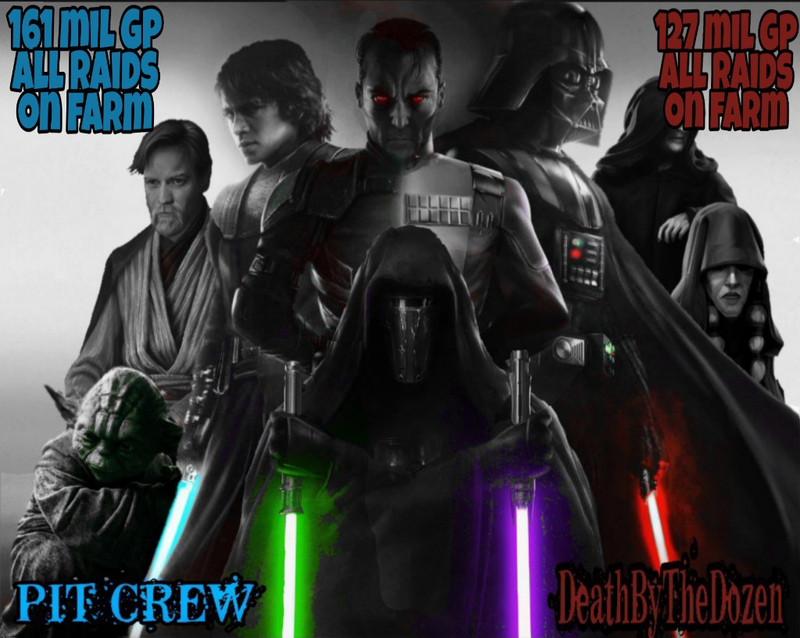 We have currently 136 mil GP, UK reset time, friendly, active and competitive guild with very good coordination, Fully Heroic guild, raids starting at 7:00pm GMT, 8:00pm GMT (HSTR) and 9:00pm GMT. So far our best TB score: LSTB - 41 stars, DSTB - 43 stars. * Discord is mandatory - to be able to coordinate guild events like TB and TW and OFC help each other. Hello, we are PTA SWH an European guild and we're around 109 M GP. We are on a community (not alliance) of more than 400 players. Here you will always have feedback about the game and other things in life in general. We have HSITH on farm and want to recruit two COMMUNITY ACTIVE players. The Samuel L. Jackson Fan Club is looking for 2 members. Are you interested in giving HSTR a shot? Read on..
We’re a semi-casual guild that is about having fun and growing together. We have a wide variety of player levels in our guild (https://swgoh.gg/g/7660/slj-fan-club/). 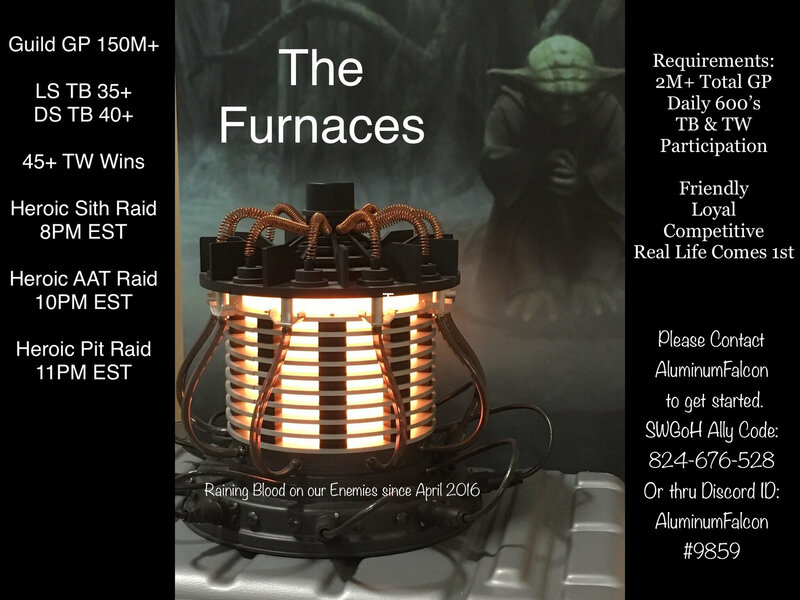 We run heroic tank and rancor raids, with 24 hour registration periods. These start times rotate from guild reset, +/-6 and 12 hours, to accommodate different timezones. We are going to try heroic Sith tomorrow! First time trying it, but we’re eager and excited. Our TW record is 53-7, LS TB 33 stars, DS TB 36 stars. If interested, hit me up on discord (arc spark#9651). -Must have DISCORD app or be willing to get it. Other than that we are a laid back group who understands life happens but still want to compete and WIN! PLEASE NOTE: We are only accepting applicants with a Galactic Power OVER 3.0M. 83 guild mates who attained Jedi Knight Revan COMPLETELY F2P!!!! the Heroic Rancor, Heroic Tank and the Heroic Sith! Friendly UK based guild looking for a few new players. Stats: 50 strong, 96m GP....but players will get kicked for not following guildrules zoon. Are you a real teamplayer? Daily active in collecting tokens and participation in guild events? The only requirement is be active,and get 600 raid tickets no activity for 30 days without notice will get you removed. An friendly active alliance community of players looking for NEW members. We have experienced members from across the world who will strive to make you the best you providing all the support you will need. Discord is mandatory we have a strong bot-assisted planning system for TBs and TW. Participate in all guild related activities - TB, TW and Raids! Who we are: A group of laid back ---active--- players who have been running a guild together for the last few years. We have recently begin successfully clearing the Heroic sith raid and are looking to fill in our missing slots to improve the ease at which we accomplish this. All guild members are currently working to improve their teams for this raid and due to recent inactives, we have been able to open a few slots to let more active players in! 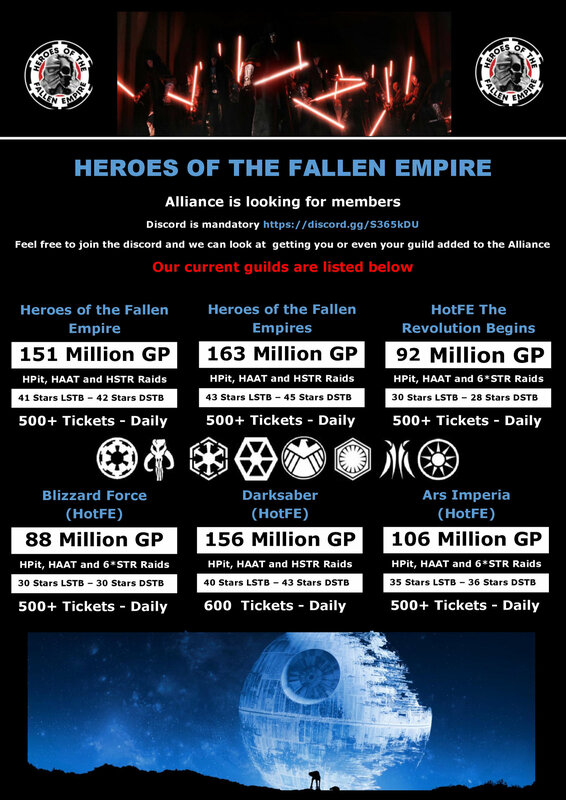 Who we are looking for: ACTIVE players who log in every day and meet the following requirements: 2 Million+ GP, and have rosters containing focused heroic sith raid teams. We are looking specifically for JTR teams or raid-ready phase 3 teams such as Chex Mix. Currently we have 50 players and almost 96mil GP but due to not participating in guildevents and not being real teamplayers spots will open up. We are invite only, so drop me a line on Discord if you want to know more about our guild, guildrules or want to join. **Nice Tauntauns** is a causal, independent, guild looking for some new people to join our active guild. 69m GP, 1.6m average, and growing every day. Looking for active players, we have a nice mix of f2p and p2p players, with no pressure to spend anything but your time. Guild Reset 7:30 pm est. 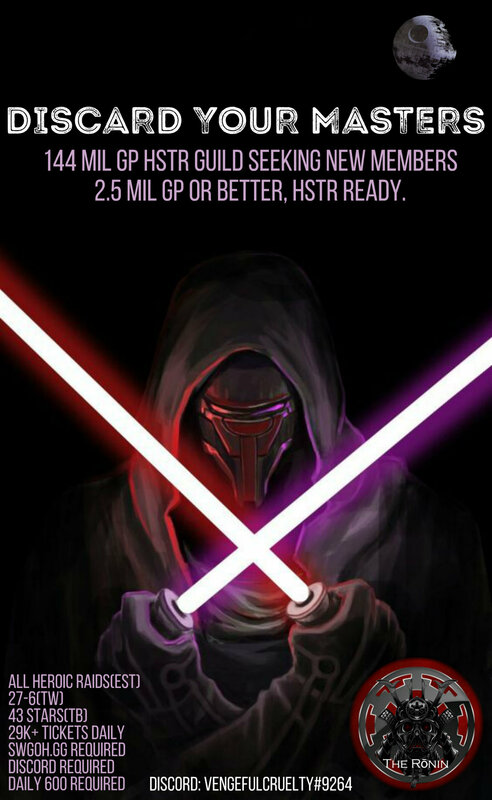 We’re looking for anyone who wants to grow with our guild and can fill the requirements, JTR line for HSTR is a plus, but not required. We want to find people to grow with our guild and help us all get better. 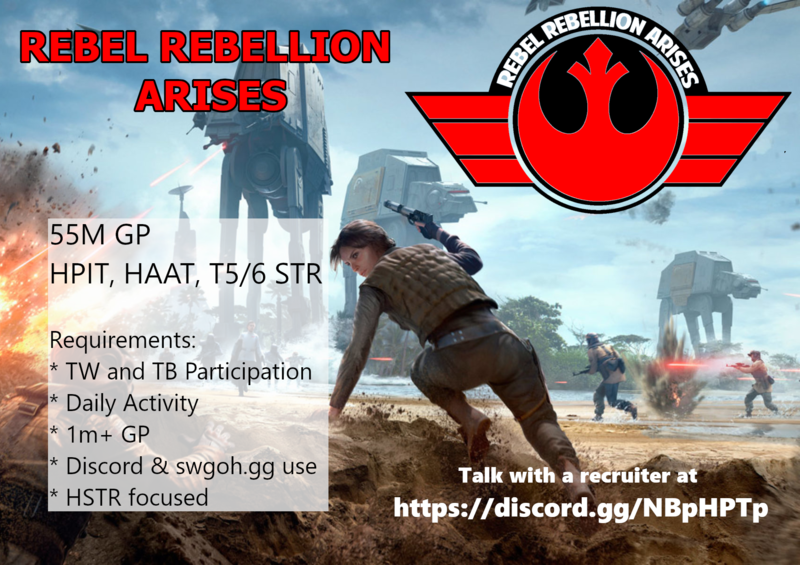 We at Rebel Rebellion Arises are looking for more dedicated members to join our ranks! we're looking to hone ourselves in preparation for the Great Traya Grind. We require both Discord and a SWGOH.GG account. If you are unfamiliar with either of these, we are happy to help set you up. Territory War and Territory Battle participation are expected. The best way for our guild to become better is for everyone to work together. Join Us, get rid of your "rebel scum" stereotype, and Arise! DarkKnight is looking to add 8 more players to our ranks. Tier 6 of Sith Raid and working quickly towards heroic. We are normally in the 35-38 star range in both Dark and Light side territory battles. We are a laid back guild with few requirements. We don’t do discord or any third party communication app. We simply ask that you be an active players who enjoys the game and is willing to help make our guild better. We would prefer 2.5 mil GP or above but will consider anyone. It's been a good January! We are now farming HSTR and have a few openings. This is a great opportunity for someone who has some HSTR experience but wants to place higher, or someone who is ready but their guild is not. We’re fun and and organized. We play smart but don’t take it too seriously. We set expectations but allow for RL to come first. Join us!